Hot water means bleaching coral. Scientists have known this for a long time. So it stands to reason that reefs in the warm waters near the equator would be at a higher risk of bleaching than their more temperate counterparts. But a new study in the journal Nature Communications from scientists at UC Santa Barbara and the Florida Institute of Technology has found this isn’t quite the case. Many corals host a symbiotic algae whose photosynthesis provides the animal with extra energy. However, when the coral is under stress, it often expels this colorful algae, revealing its white skeleton underneath in a process known as bleaching. Burkepile and the team tapped into data from the Reef Check Foundation, a global citizen science project that began in 1996 under the direction of study co-author Gregor Hodgson. The researchers combined field observations of coral bleaching at 3,351 sites across 81 countries from 1998 through 2017. They found that coral bleaching was less severe in the low tropics (close to the equator) and in regions with naturally high surface temperature variability. The authors suspect that, for corals that live most of the year in consistently warm water, a little extra heat is not a big deal. On the other hand, corals used to high levels of variability may be better able to cope with warming events as well given they are used to a range of temperatures. What’s more, corals seem to be able to withstand higher temperatures before bleaching now than in the past. Scientists are still trying to understand why, but it could be evidence of adaptation or the previous removal of weaker species or individuals. “But coral reefs are not out of the woods,” said Burkepile. “They are under extreme threat in the near-term — the next few decades to century — from climate change.” As carbon emissions continue to rise, we’re likely to continue to see the same trend in increasing frequency and intensity of coral bleaching, he noted. Co-author Rob van Woesik echoed this sentiment. “We are uncertain why equatorial reefs are more tolerant of recent temperature stress, but we do know that we must protect these equatorial reefs — and reefs everywhere — from other disturbances,” said van Woesik, director of the Institute for Global Ecology at Florida Tech. The models scientists currently use to predict bleaching events are pretty accurate, but they work on large scales. 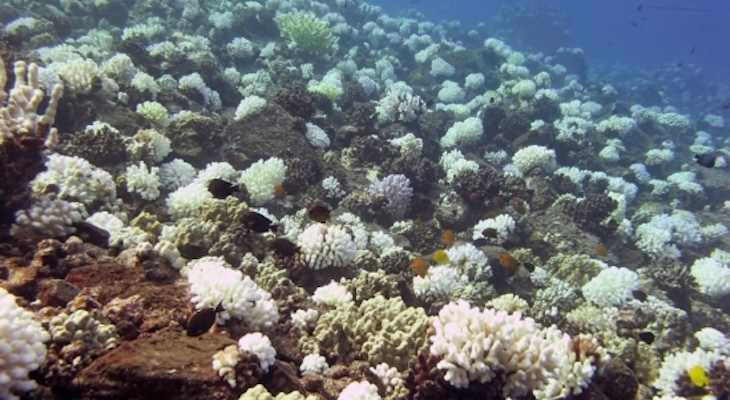 They are not designed to predict the extent of bleaching on the level of individual reefs or islands. “And that’s really the scale we have to start thinking about if we’re going to facilitate reefs either becoming more resistant to bleaching or helping reefs recover after these bleaching events happen,” said Burkepile. The models the team developed for the paper fill in the gap at these smaller scales. However, rising ocean temperature is only one puzzle piece in the picture of coral in the 21st century and beyond, researchers say. Coral reefs are threatened by pollution, fishing, ocean acidification and many other activities. The team plans to follow up on sites that fared better and worse than average to learn what factors made them more or less resilient against bleaching than scientists would otherwise have predicted. They suspect that reefs that had more severe bleaching events faced many of these other stressors in addition to high temperatures.